Review posted February 20, 2018. Candlewick Press, 2017. 50 pages. Here’s a beautiful large-format book of poems celebrating poets. 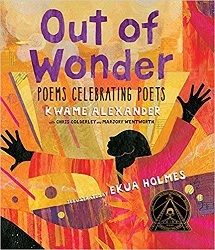 Kwame Alexander and his two co-authors have written poems in three sections. Poems in the first section match the favored style of the celebrated poet. Poems in the second section incorporate the feelings and themes of the celebrated poet’s work. And poems in the third section respond to the celebrated poet with thanks. It’s all done with large, lovely paintings accompanying the poems, in a book in large format. To hold this book and leaf through it gives you a feeling of grandeur, nicely setting off the importance of these poets. A poem is a small but powerful thing. It has the power to reach inside of you, to ignite something in you, and to change you in ways you never imagined. There is a feeling of connection and communion – with the author and the subject – when we read a poem that articulates our deepest feelings. That connection can be a vehicle on the road to creativity and imagination. Poems can inspire us – in our classrooms and in our homes – to write our own journeys, to find our own stories…. Allow me to introduce you to twenty of my favorite poets. Poets who have inspired me and my co-authors with their words and their lives. They can do the same for you. Some of the poets we celebrate in this book lived centuries ago and wrote in languages other than English, while others still walk the streets of San Antonio and New York City today. Chris Colderley, Marjory Wentworth, and I had two requirements for the poets we would celebrate in Out of Wonder: first, they had to be interesting people, and second, we had to be passionately in love with their poetry. Mission accomplished! I believe that by reading other poets we can discover our own wonder. For me, poems have always been muses. The poems in this book pay tribute to the poets being celebrated by adopting their style, extending their ideas, and offering gratitude to their wisdom and inspiration. Enjoy the poems. We hope to use them as stepping-stones to wonder, leading you to write, to read the works of the poets celebrated in this book, to seek out more about their lives and their work, or to simply read and explore more poetry. At the very least, maybe you can memorize one or two. We wonder how you will wonder. This is one of those books where you need to see for yourself how striking it is. Check it out!